A few days after the version 1.0.0, we are releasing the version 1.1.0 of the GitBook Editor. This version includes many improvements and bug fixes. This release fixes a bug in the update checking. This bug makes it impossible for releases 1.0.x to signal a new version. This new release lets you customize the layout to stay more focus on your content. 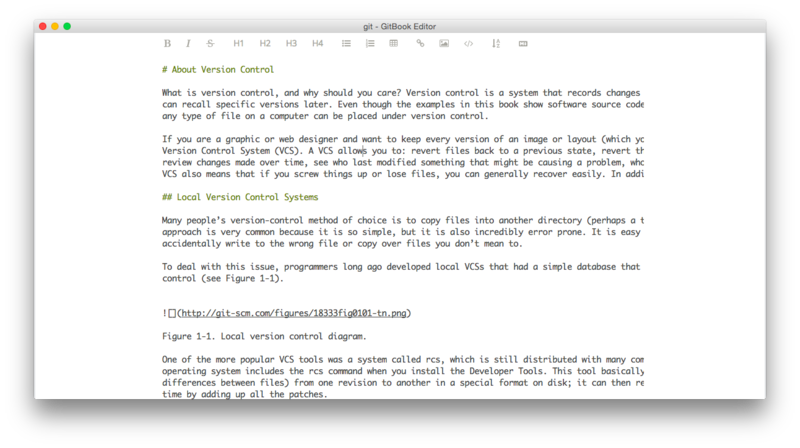 By triggering Cmd-Shift-F on Mac or Ctrl-Shift-F on Linux/Windows, the summary and preview panels will be hidden. You can also hide specific panel from the View menu. This version also includes some minor features like the ability to read the ChangeLog from the “File” menu, more options for the editor (show/hide invisible characters, line height, …), and some improvements for the preview on the browser (open current section, etc.). Math context menu: we disabled the context menu on math elements to avoid a crash that locks the editor application. Book Configuration: we fixed the JSON edition dialog, to handle errors in a smoother way. Normalization on auto-save: In the 1.0.0 release, we intoduced the auto-save functionnality; this feature coupled with the noramlization features (whitespaces and end-of-line) was troubleshooting the writing experience.